Unfortunately, seems as for recent events in my life have overtaken my reviewing capabilities, and these reflections find themselves long after the release of these albums. Despite the fact that some may look at this as yesterday’s news, maybe some of you may appreciate what we have to say in any case. 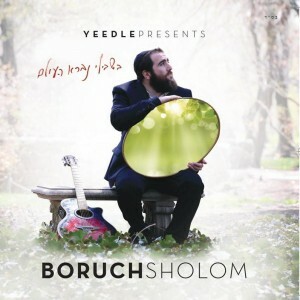 Baruch Sholom Blesofsky’s debut album is not a typical debut by any stretch of the imagination. [Full disclosure – I have been chavrusos with Baruch Sholom’s cousin for a very long time now; however, his opinion has not shaped this column whatsoever.] Blesofsky’s creativity and broad talent have allowed him to come out with an album worthy of an old pro. This may be also due to Yeedle’s production skills, but there’s no question that Blesofsky’s full flavor character comes right out at you with this bold, brash and bouncy album. ” There are four meanings to the world Olam: World (Space – Olam עולם), Time (Forever – L’olam לעולם), Strength (Youth – Ilem עילם), Concealment (He’elem העלם). Gutte Voch: ***** Rocking on, Boruch Shlom belts out a tune that fits the rhythm of the Motzei Shabbos poem like a glove. He adds on a spot of Sefardi to his vocal repertoire; and again, the harmonies all the way through show unique talent – constantly changing things up, keeping it all fresh and real. The siren-like guitar wails perfectly amid the deep rhythm, and Yeedle spots beautifully. This does not sound like a freshman offering in the slightest! Tefilla Lemoshe: *** An old-style Jewish music ballad. It’s gentle and soothing, but it’s not where Blesofsky excels. The sweet airy flute in the arrangements creates atmosphere, and the percussives match it nicely. Lo Yemalet: ***** Now we’re talking! Right back to the where we started with dashes of humor and creativity with this wicked number with a nasty beat. He seamlessly weaves multiple harmonies, driving half a dozen unique songs over the chorus – which itself could have been just a harmony. A stroke of brilliance pulled this one out. And the song blasts out with power after the break at 3:16 – way cool. I’d say this song has hefty horsepower, but that would be just… wrong. Time in my Life: **** Opens trance-like, and builds a message about getting past the ugly stuff in life. Great messaging for the teen crowd. At 2:47, he exhibits a slice of hip hop, but wisely moves past it into the solo and returns to the heavy beat. Once again, great work on the backing vocals. Screaming Your Name: **** This number speaks to me, as we read the news coming out of Israel every day nowadays. The arrangements balance the sweetness of the first stanza, focused on the vocals, with the second stanza – in which bass, drums and keys go full bore with power – particular kudos on the bass. He hits top notes perfectly, sounding a bit like Eli Schwebel. The great instrumental bridge combines multiple genres with ease. At 4:45, he really lets it go, but makes it completely natural. Another great job. Shuva: ***1/2 An energetic and meaningful Lubavitcher nigun, composed in honor of the Rebbe’s 91st birthday. It was last performed on Moshe Laufer’s Chabad 2 and 3; the first being instrumental version, and the second in which Mendi Gerufi performed. This version has more of an electro spin to, and is missing the last section of the song with no words. I have no idea why they took that part out. Great beats at 2:40, with more funky harmonies, but respecting the nigun, he keeps his creativity to a minimum. Hisnaari: *** An MBD-style crooner, with a unique vocal opening. It harkens back to Track 3 – I’ll give it the same critique. Shmoozen: ** I don’t quite get this one. A Lipa trance number that would be best served, if at all, by Lipa himself. Not as if he doesn’t do a good job; but Lipa gets away with this shtick more easily. His guest vocalist, a deep baritone (I don’t have the liner notes) sounds… well, for lack of a better term, sketchy. Vayechulu: **** Back to normalcy. I love the catchy, simple wordless section. Yeedle reappears for a proper solo that fits his unique sound perfectly. Together, they squeeze everything this tune’s got, speaking the lyrics. The alto sax and then baritone sax bring it to a conclusion, accompanied by the classy guitar. Another great number. I’m looking forward to his next offering – the guy’s got serious talent, and I hope his creativity is focused properly and he doesn’t get too far on the artsy side. Seems like Yeedle really knew how to draw out his best, and I hope they continue together. Great review! I enjoy this album immensely as it is fresh, but as you mentioned, not too artsy. I completely agree with you about Tefillah Lemoshe and Hisnaari. In regards to ‘Screaming His Name’, the vocalist on the high part is actually Shulem Lemmer. Just another comment- The guest vocalist on ‘Shmoozen’ is Zevi Fried. Thanks for the updates – I never received the liner notes, so I appreciate the info.